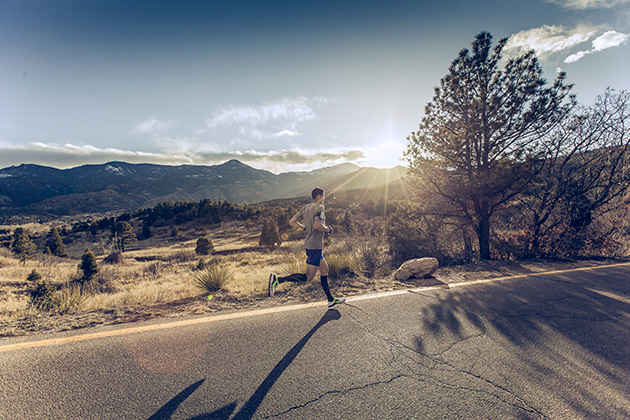 Inside the training regimen of one of the top triathletes in the world, Andy Potts. The Andy Potts work week is a little different than the average folks’. On a recent weekday, Potts spent some time chatting with SI.com from his home in Colorado Springs before embarking on his day’s agenda: a three-hour-and-20-minute bike ride followed immediately by 90 minutes of interval work on a track with his coach. Potts would follow those two intense activities by going home and lifting weights for an hour, stretching for 15 minutes and then indulging in a three-minute shower—yes, he times out his showers—before eating lunch in the car on his way to swim practice. There, he had two hours lined up, with “movement required” for eight full hours of training. Of work. Sure, it was a big day. But all of Potts’ days are big, as befits one of the leading triathletes in the country, no matter the distance. “I don’t quite reach 40 hours of work a week, but I get pretty close,” Potts says. “We are getting after it. I don’t have a lot of fluff involved.” So that’s about 38 hours a week of intense training. Potts also takes a step back, looking at his career as an evolution, both personally and athletically, using his mistakes to apply new principles in his training. That perspective has helped him focus on the journey, instead of dreading the pain. ​But even as Potts puts a focus on the Ironman-style length, he still mixes in races as short as two hours for the variety. The mixing of distances helps him “lift the whole game” and keeps him mentally sharp. “Each distance presents a different hurdle,” he says. The Ironman, for example, offers a high mental hurdle, forcing athletes to persevere and stay focused for eight-plus hours. But for Potts, he enjoys the mental hurdle. “For me, for some reason, the mental hurdle has been a small hurdle, I’ve been able to focus and stay driven and I guess I thank my parents for the skill and my coaches for cultivating and nurturing it,” he says. In an Ironman-length race, putting a focus on a single cone, instead of the hundreds he’ll ride past, allows Potts to stay mentally in tune. Part of that in-race optimism comes, though, through that week of intense training. He does take a few liberties, though, working about 60 percent of his time on a bike and another 20 percent each for running and swimming. He drops the running and ups the swim to lessen the “punch back” the pavement hits him with and enjoy the non-impact benefits of swimming. Through swimming, Potts says that by having his blood flow from his fingertips to toes with a high heart rate helps draw oxygen to all his muscles and allow the recuperative powers that blood brings to heal micro tears throughout his entire body. While Potts deals with the mental and physical hurdles of his extreme work, another hurdle he’s always dealt with is nutrition. Off the course he packs in the calories, starting with the biggest meal of the day at breakfast and then working his way lighter throughout the day, mixing in lean proteins, a variety of greens and a healthy combination of carbohydrates that include pastas, bread, quinoa, couscous and farro. Finding his optimal nutritional balance has been a 13-year experiment and one that can change on a daily basis, he says. On a race day, for example, Potts does what some may consider the unthinkable, opting for “gut bomb” muffins because “they fit well in my tummy.” The experienced racer still gets nervous on race day, and he’s found that muffins work for him, sitting well. During the race, he eats old-school PowerBar performance bars and other PowerBar products in his hydration. All this on his quest to parlay his training into performance. Everything about a typical Andy Potts training session or race has an increased intensity and duration. But through over a decade of trial and error, he has built it that way. He’s cut away the fluff. And it has paid off.